Great Yarmouth, often known to locals as Yarmouth, is one of the largest coastal towns in Norfolk. 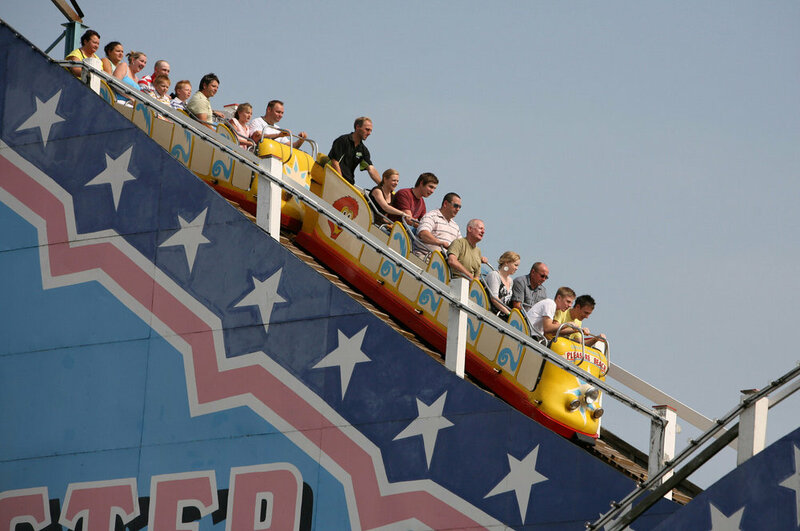 It is just 7 miles south of Hemsby, so Belle Aire is ideally placed for taking in all the attractions that Great Yarmouth has to offer. Yarmouth is a family-friendly destination and has a superb choice of places to eat and drink, a bustling town centre and a large number of regional attractions, including the Golden Mile on the seafront, Britannia and Wellington Piers, Hippodrome Circus, Sealife Centre, The Pleasure Beach, and a model village - to name but a few. Photo courtesy of gypb via Wikimedia Commons. Top image courtesy of Steve Sea. For thrill-seekers the Pleasure Beach is the home of one of the few remaining wooden roller coasters which employs the skills of a brakeman. The ride is virtually unique as the brakeman is required to ride with the train to control its speed as there are no brakes on the track. It is the second tallest and fastest wooden roller coast in the UK! For retail therapy, the town centre is full of all sorts of shops and stores, from an independent department store to the bustling market place, Market Gates shopping mall and the Victoria Arcade.